(John Stonestreet – BreakPoint) Occult spirituality is on the rise, even among Christians. Is it just pop culture or is it the Prince of Darkness? My guess: it’s both. Netflix’s most talked-about new show this fall is “The Chilling Adventures of Sabrina.” The “Sabrina” of the title is Sabrina Spellman, a half-witch/half-mortal who is about to celebrate her sixteenth birthday. On that day, which is, not coincidentally, October 31, she is expected to undergo what the show calls a “dark baptism,” in which she would pledge loyalty to Satan. 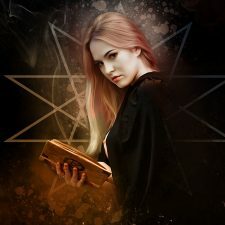 Now before you are tempted to say “Okay, it’s just another stupid TV show,” consider this: According to recent reports, occult ideas and practices are booming in the United States, and not just outside the church. A recent Pew Research study found that a large and growing percentage of Americans believe in reincarnation, astrology, psychics, and the presence of spirits in nature. The occult is becoming mainstream in this country. At least part of the reason why is how easy, user-friendly, and infinitely customizable the chaotic buffet of beliefs borrowed from Eastern pantheistic faiths and pre-Christian religions is these days. There’s no church or creed or set of rules. You can pick and choose whatever you like. It’s spirituality meets consumerism. And you are the god. Disclaimer: This news story is posted for informational and research purposes and is not in any way intended as an endorsement of BreakPoint.